K3 turned one yesterday. One! I'm having all the emotions about it because it feels like he was born yesterday and forever ago all at the same time. It's one of those "the days are long, but the years are short" things, but sometimes it feels like the days just aren't long enough. We aren't celebrating with a big party until next month because we are in the middle of moving hell, but all the boys are enjoying little celebrations of everything we have accomplished as a family this year. We adapted to being a family of 5, we planned and enjoyed a big wedding, we traveled, I returned to work, Keith changed jobs, we sold two houses, and next week we will buy our dream house. 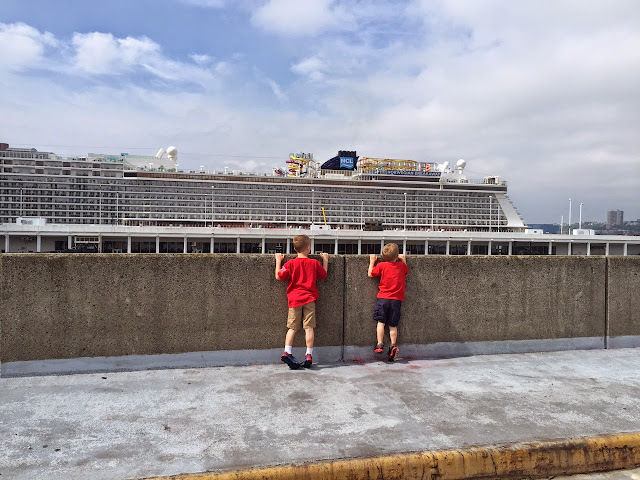 It's been a whirlwind of good things happening, which I have not taken for granted, and I feel is reflected in the super joyful disposition of K3. He knows how to work a room, and everyone who meets him falls in love. We have had so many laughs this year because of this little guy, and the happiness he brings to our family is immeasurable. As much as I yell at JD and O to be kind to each other and play nicely, when it comes to K3, I have only had to remind them to give him some space and don't smother him with snuggles. They adore their baby, and I hope that doesn't wear off once he gets tall enough to reach all the toys. I will have posts about the wedding (so many fun projects!) and the move (the projects will never end), but right now that can all wait so I can enjoy this summer at home with my boys. I'm not going to lie. I rubbed the Parker Time Relax Potion on myself more than I did my infant. The last month has been NUTS. We got married (MARRIED! ), finished up a school year, and are going through all the processes involved in selling two starter houses and buying one big forever house. Anything that helps anyone in this house relax is priceless! 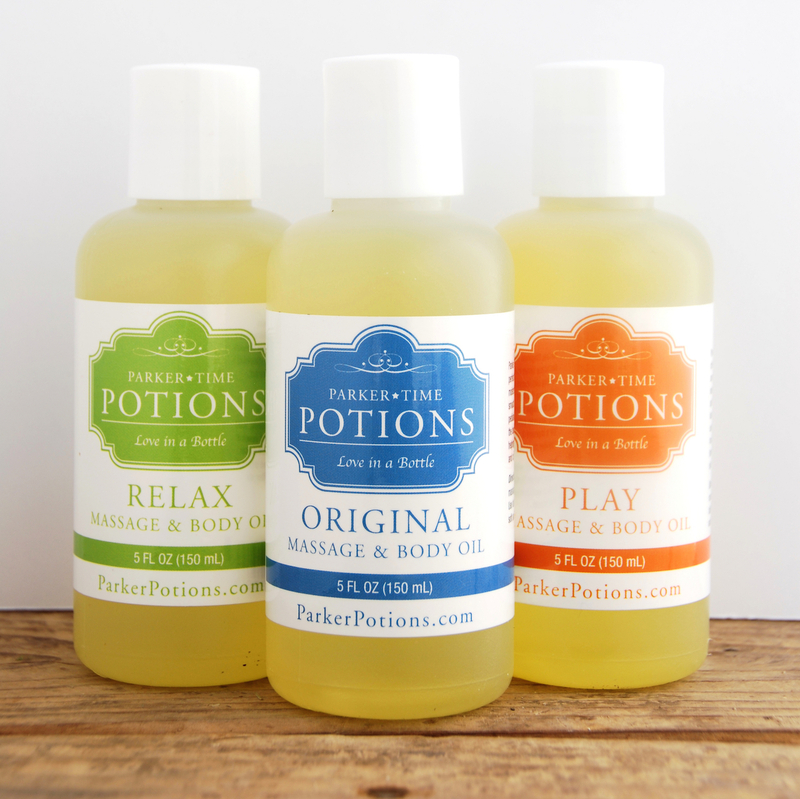 Parker Time Potions Pediatric Massage Oils showed up at my door at the right time! It's specially formulated, all-natural body care that offers numerous moisturizing properties. I love that it's a mom-created product born out of necessity, and also that a portion of all proceeds funds autism research. Each bottle contains a blend of sunflower oil, jojoba oil, calendula oil, and Vitamin E that work to safely moisturize even the most sensitive skin. 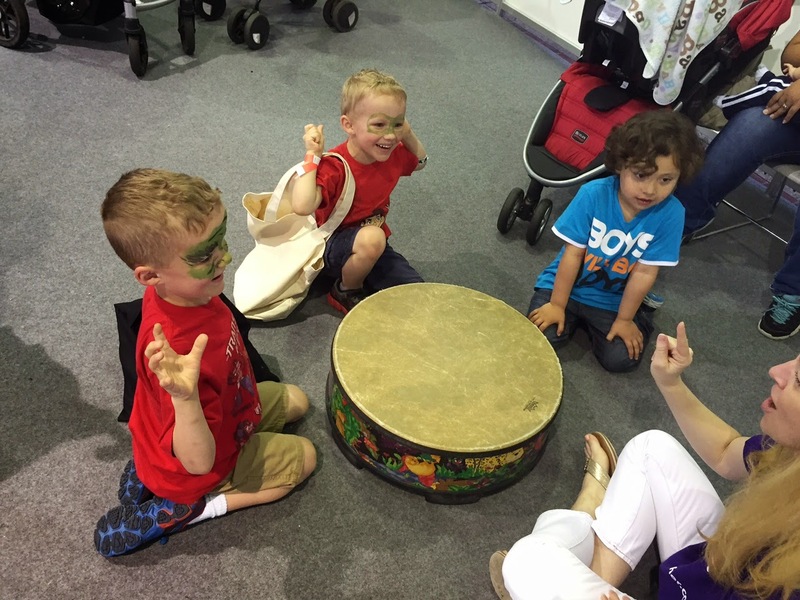 The gift pack comes with three varieties: Original, Play (infused with sweet orange essential oil to not only promote the parent child bond but to also promote play) and Relax ( with Lavender Rose essential oil to promote calmness). And now you have a chance to win a set of your own to try out. **Disclosure: Park Time Potions sent me products to review and is providing products for the giveaway. All opinions are my own. BooginHead is a mom-owned business that specializes in parenting essentials that make life easier (and more stylish) for us all. 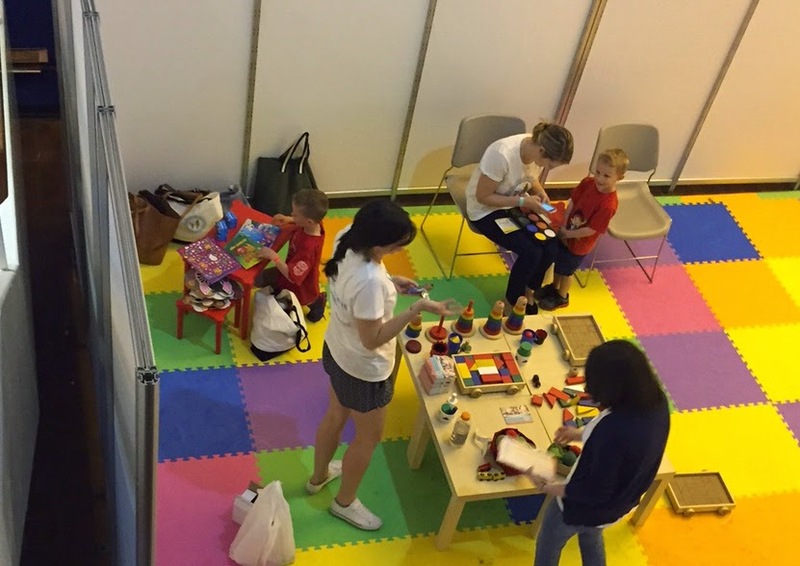 It all started with the mom-invented SippiGrip, which can be used with bottles and cups of different shapes and sizes and is available in a wide variety of colors and patterns. It has an adjustable length to use with strollers, car seats and high chairs, and my favorite feature is that it is machine washable. It keeps K3 from throwing everything off his highchair- and keeps me from constantly fetching everything he throws. Now that three of us bring a packed lunch every day, Keith and I made a big effort this year to be as green as possible in our packing. 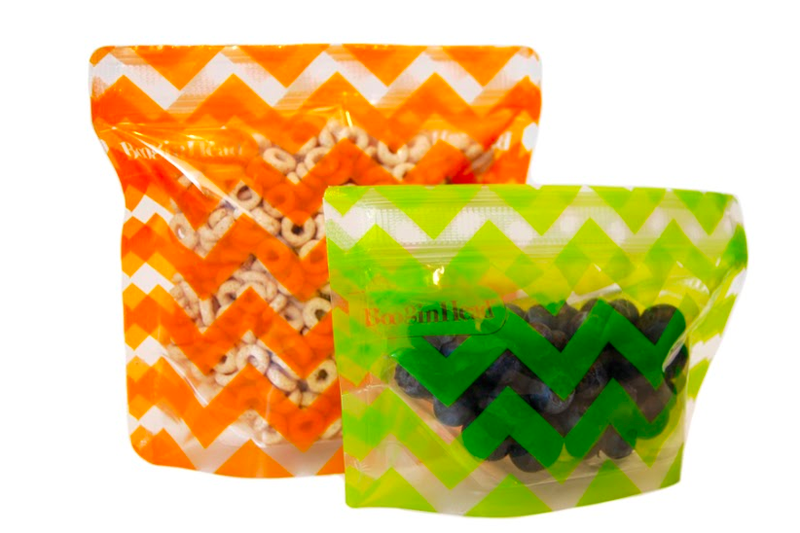 I stocked up on all different kinds of reusable containers, and Booginhead's Eco-Friendly Pack'Ems Reusable Snack Bags are a great addition to our stash. They come in two sizes, have a convenient stand-up design, and are dishwasher safe. They are much more cheerful on my desk than a plastic sandwich bag. It is no secret that we love squeezy pouches in this house. They are a fun, on-the-go snack for the bigger kids, a quick thing to grab for my breakfast on-the-run in the morning, and an easy-to-pack meal for K3. 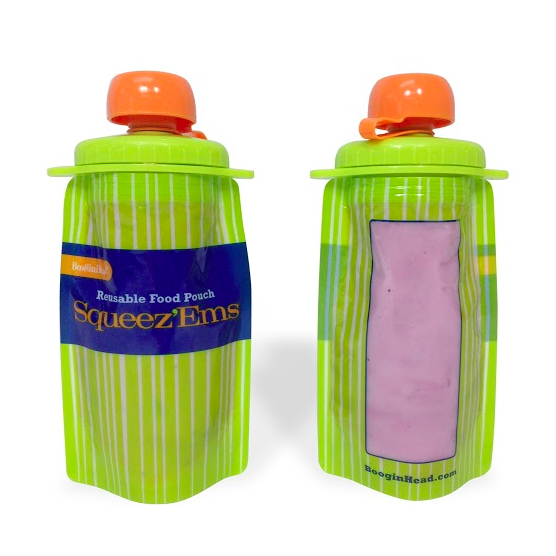 Squeez'Ems Reusable Food Pouches are a much Earth-friendlier alternative to disposable store-bought premade food pouches, because they are refillable and reusable. We can use them for our homemade purées, smoothies, applesauce, yogurt... just about any of our favorites. It's all one piece (there are ENOUGH pieces floating around our kitchen from bottles and sippies) and has a 100% leakproof seal. And thanks to BooginHead, you can win all of these products! **Disclosure: Booginhead sent me products to review and is providing products for the giveaway. All opinions are my own. This past Sunday, the boys and I took a drive into the city to attend the New York Baby Show and enjoy a sunny day. With all the stress of house buying/selling and wedding planning, it was great to have a day that consisted of nothing but fun things and quality time. Most of our favorite things in the city are on the west side- including big boats with water slides. When I asked the big boys about their favorite part of the day, they said the treats- because almost every booth had cookies, candy, or cupcakes for them. This meant they wanted to stop and talk to everyone to see what sweets they were offered. That worked for me because it gave me time to learn about a lot of new products and make some new friends. I ended up buying a new baby carrier from Bitybean (I saw that Suzanne bought one the day before, and I figured she certainly would know a good baby carrier when she sees one) and the BiteSizers from Mixed Pears. 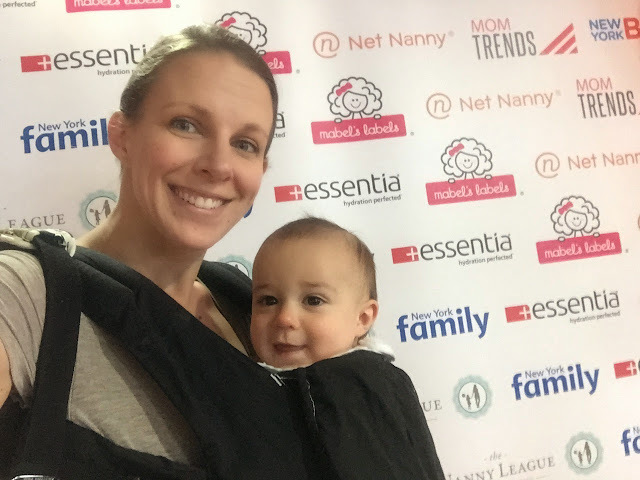 My favorite part of the day was the Momtrends Blogger lounge. It was great to see a friend from Mabel's Labels and snack on the yummy food. 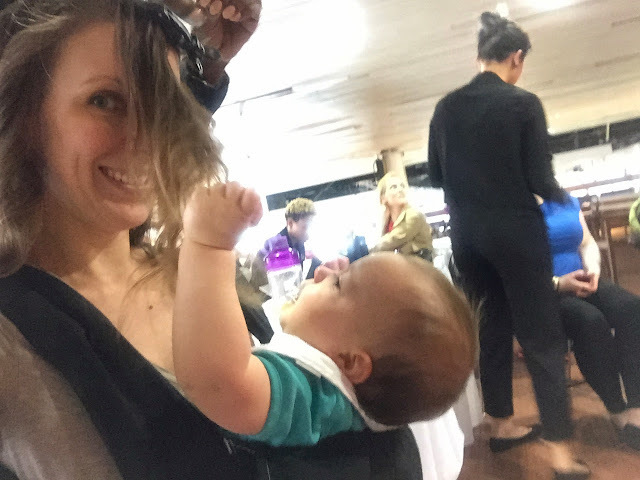 But selfishly, it was great to leave the bigger boys with The Nanny League to enjoy some pampering from the Glam Squad. They are expanding to Long Island soon, so check it out! The thing that made my kids the happiest was their time with East Side West Side Music Together. 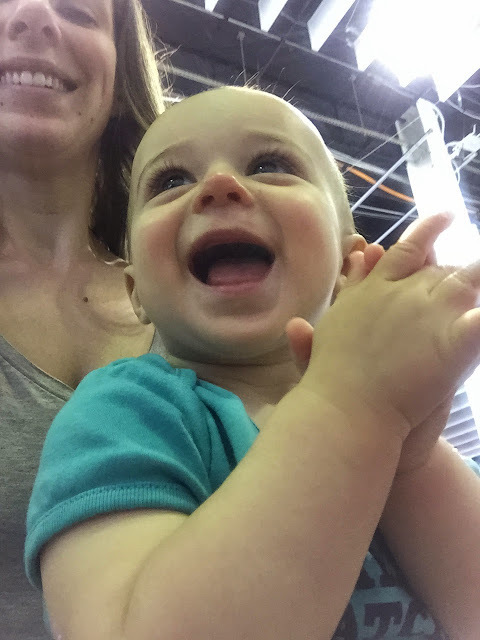 At first, just JD and O were sitting for the class while I fed the baby, but K3 is mighty proud of his new clapping skills and demanded to be included. It was such a great, family-friendly day, that I made Keith promise that we would all go together next year. 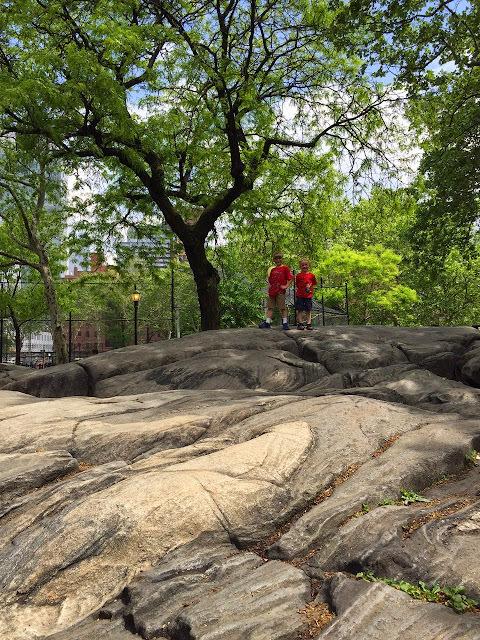 Can't leave without hitting up at least one playground. *Disclosure: I was compensated for this post and provided with free passes for the show. All opinions are our own. Anyone who knows me knows that I have a terrible memory. How much does the baby weigh now? When did James start walking? I. Have. No. Idea. I figure if I really need to know, I can always go back through my photos, check the dates and do the math. The doctor gives us little cheat sheets of the kids' info at every visit, and those are all tucked in a folder. But when the boys' agent calls asking their height and weight, I frantically flip though my phone hoping I made a note at the last visit. I feel like a mess. 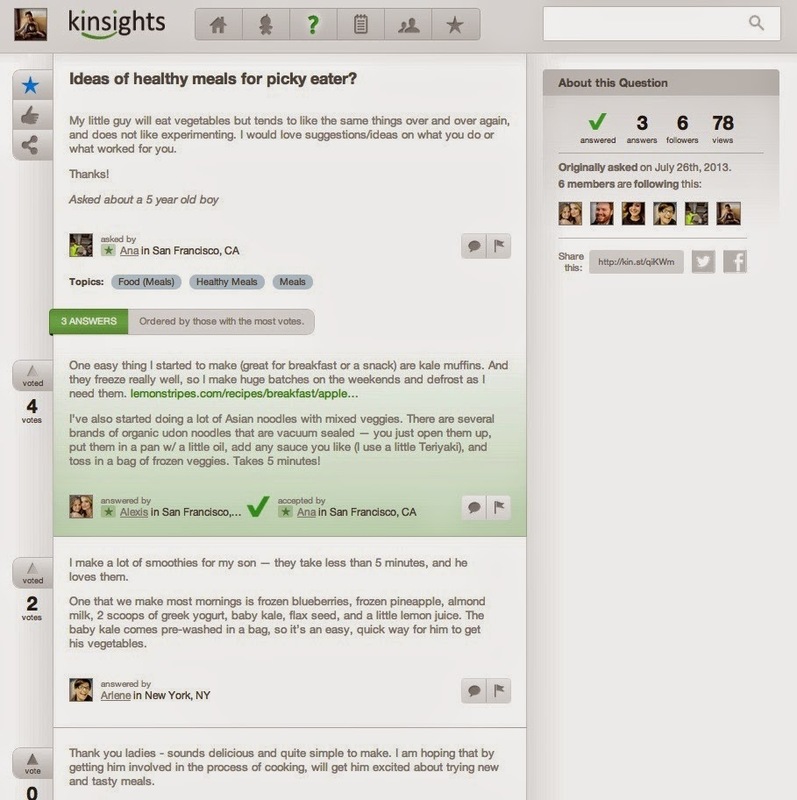 Kinsights to the rescue! Kinsights is an online Pediatric Personal Health Record Keeper for parents. 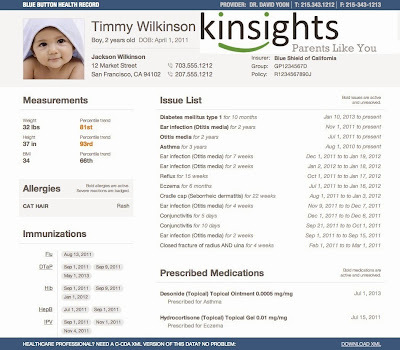 I can organize their growth, immunizations, medications, test results, and more, all in one spot. I especially love how I can check off each developmental milestone when they reach it, so I'll always remember when K3 started showing off his thumb-finger grasp skills! It has an easy, user-friendly setup with different pages for each child. And it also has a community page where you can join groups (there's at least one for every type of family and special need) to seek and share answers to parenting questions. Here's a sample of a Q & A page. Medical info is kept private, but you can send anything you enter to a doctor or hospital in an emergency. Check it out, and find me (search Tryitmom)! And while you're browsing around, take a moment to enter my $25 Amazon Gift Card Giveaway from Kinsights! **Disclosure: Kinsights is providing the gift card for the contest. All opinions are my own. K3 is ready for Fleet Week! And his cousin's First Communion. And any other occasion that calls for more than his usual onesie and sweats. His fancy new threads are thanks to Feltman Brothers and their handmade, heirloom-quality baby clothes. Since 1916, this family-owned business has been designing special occasion wear that can be passed down through generations. Their special embroidery techniques are still performed on machines that are almost 100 years old! 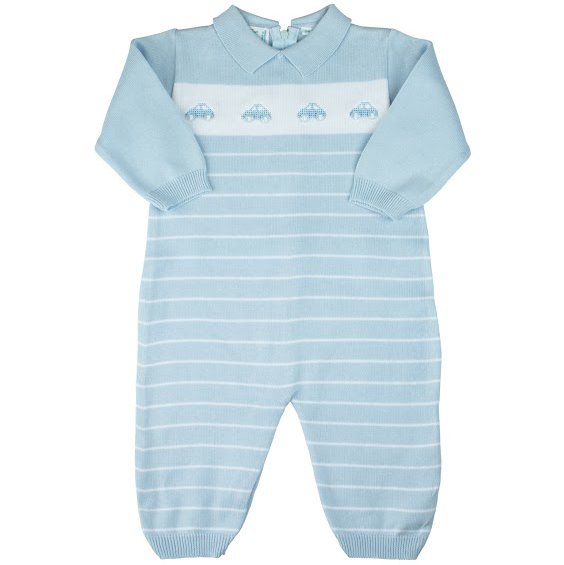 K3's knot romper is 100% cotton and machine washable. I found it true to size, soft, and snuggle-able. I can't wait to have a reason to buy a friend with a baby girl one of their precious dresses. Find more beautiful designs from Feltman Brothers by visiting their website. And you can win an outfit of your own for a sweet little one in your life. **Disclosure: Feltman Brothers sent me a free outfit to review. All opinions are my own. Half way through April? How? Less than two months until the wedding? No way! SO MUCH has been going on around here. We've been so occupied with showing/selling our house, finding a new house, checking out new school districts and neighborhoods, and getting wedding details taken care of, the long spring break just wasn't long enough. K3 turned 8 months. He is pulling to stand and speed crawling all over the house. He loves the recent nice weather since we've been going for walks and spending more time outside. It's a whole new world. And he is LOUD. Babbling like crazy to anyone who will listen. He has two tiny, new babies in his daycare class, and the baby fever is real, people. O and JD started Little League. Well, games don't start until this weekend, but they had a parade and practices. I had a birthday and was spoiled to death by Keith. I'm a lucky girl! The older boys have become obsessed with this #disneyside app that turns your face into a Disney character. What they don't know is that the app saves all their selfies to my phone. It's pretty awesome. Keith and I enjoy spending time with our friends and family at a couple's shower at a local brewery, but I'll post lots more wedding stuff as it gets closer. When I was approached to review Cardiff's Travel Headrest, my first question was about safety. I know that it is not safe to have "extra" things in the car that could become dangerous in a crash, but I was assured that it meets the FMVSS213 and CMVSS213 standards. My kids definitely have a bobble head affect when they fall asleep in the car, and it looks so uncomfortable! Once assembled (I had a little trouble snapping the pieces together, but it's SOLID, high quality stuff), it was quick to install. It can stay in the car all the time because the arms can swivel up and out of the way. The arms of the headrest have soft, padded fabric sleeves that are removable and machine-washable for easy cleaning. It didn't work with our high-back booster, but it was great with the BubbleBum. I think I'll claim that seat on road trips so I can nap! sweet dreams. no sore neck. Here is JD with all three products from the giveaway: Cardiff Headrest, BubbleBum, and MyBuckleMate. I'll be posting car-related posts all week, ending with one big giveaway of all the items, including the Cardiff Travel Headrest! **Disclosure: Cardiff sent me a free product to review. All opinions are my own. I'm continuing my week of car-related posts with MyBuckleMate. Anyone with a kid in a 3rd row knows how important it is for that kid to be able to buckle themselves. JD has been buckling himself in for a while now, but sometimes it takes a while, and time is precious in our morning routine! After installing MyBuckleMate (which took seconds), he said that it was "easier because it doesn't move around as much". 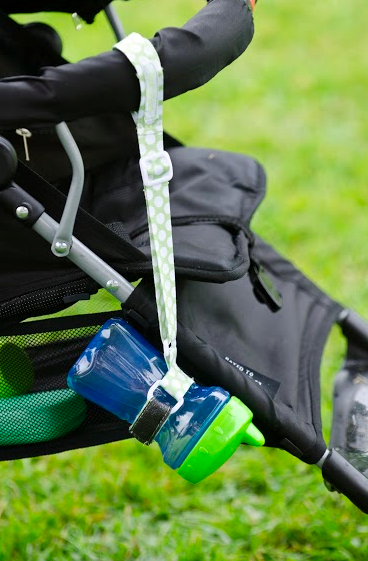 It keeps the buckle propped up and easy to reach. This is how the buckles usually look. This is how MyBuckleMate props it up. It even fits in the tight place next to JD's booster. I'll be posting car-related posts all week, ending with one big giveaway of all the items, including MyBuckleMate! Enter below and keep checking back all week for more posts & chances to win. 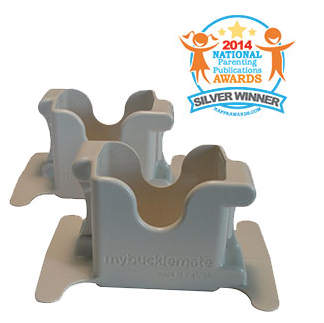 **Disclosure: MyBuckleMate sent me a free product to review. All opinions are my own. When I was pregnant with K3, Keith and I knew we would both need new cars to accommodate our growing family. We looked at EVERY make and climbed into the back of EVERY model to assess how the car seat situation was going to work. We settled on the Honda Odyssey for me, and that is the vehicle we do almost all our family travel in. One giant vehicle was enough, so Keith decided against a super-sized SUV with a third row and got a Jeep Grand Cherokee. He keeps an infant base and a high-back booster latched in the backseat, but BubbleBum is what makes it possible for him to fit all three kids safely if he needs to. All 3 in the backseat! 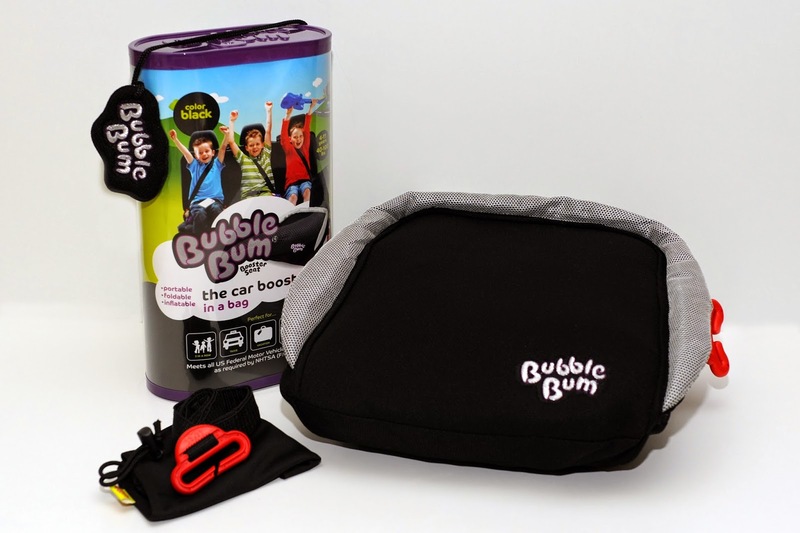 BubbleBum is an inflatable booster seat for kids ages 4-11 and weighing 40-100 pounds. With Little League season starting up, and two of our kids on two different teams, I see carpooling in our future. I can send James with this if someone offers a ride, or keep it in the minivan for any extra kids we accumulate. Deflated, it's also small enough to throw in my diaper bag for taxi rides in the city. And because I'm always worried about car safety, I checked out its rating: the IIHS (Insurance Institute of Highway Safety) named it their “Best Bet” in their booster seat evaluation report. I'll be posting car-related posts all week, ending with one big giveaway of all the items, including a BubbleBum inflatable seat! Enter below and keep checking back all week for more posts & chances to win. **Disclosure: BubbleBum sent me a free product to review. All opinions are my own. When I was asked to choose a piece of Isabelle Grace Jewelry to review, I spent way too much time browsing their site and daydreaming about all the different ways I could personalize each piece, gifts I could give to my friends and friends' daughters, and the gifts I would like to receive. I liked that each piece is meant to be an heirloom, and I could create a piece that tells my story. Instead of using my boys' initials, I decided to tell my love story and get a piece with my and Keith's initials. As with all their pieces, the necklace I designed is handmade in the USA. It arrived surprisingly quickly and beautifully packaged. 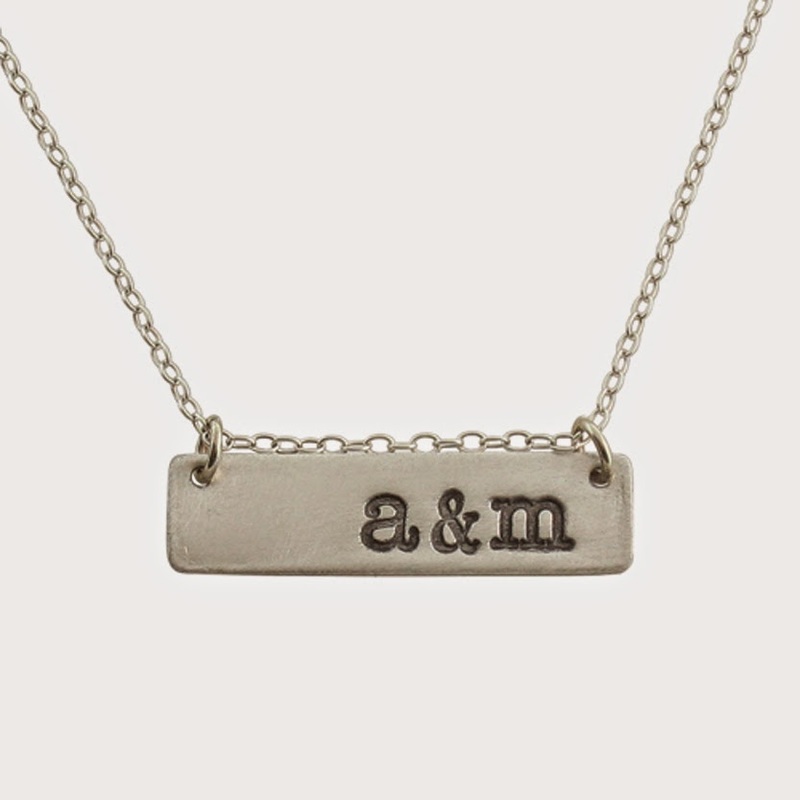 This is the Initial Bar necklace I chose. I love the way it came out, and it's perfect for everyday wear. It survived a lot of this! Isabelle Grace is kindly offering another necklace for a lucky reader. Use the easy entry below, and good luck! If you're looking for more, check out Isabelle Grace Jewelry on Facebook, Twitter, Pinterest, and Instagram. **Disclosure: Isabelle Grace Jewelry sent me a free product to review. All opinions are my own. We are STILL having snow days here, but hopefully I will be talking about SPRING in the next update. Hopefully. O had a special time at school as Star of the Week, and I was very happy to be able to visit his classroom. They were also celebrating Chinese New Year, so I read a book about what kindergarten is like in China and we practiced eating snack with chopsticks. It was ADORABLE. K3 passed his 6 month tests with flying colors- except for the hearing test because he didn't let them put the thing in his ear for long enough to get results. The paper did not stand a chance. The boys and I had a great February break from school, and although we didn't venture out in the cold often, we did visit the Cradle of Aviation Museum with my mom. All three boys continue to do well in their swimming lessons. K3 is kicking on his own, O passed his level four test, and JD is getting more and more competitive. And just this past week, K3 turned 7 months! He is silly and happy and curious and fast. He is on the move and getting into things already. One of his favorite times is when I put him on the floor with a basket of toys that he can pull out and spread around. As far as Keith and I, there are exactly 101 days until the wedding!! We have a bunch of offers on our home, and we are house hunting like it's our job. It's like we are doing every stressful thing all at once, and then the rest of our lives will be cake. I can't wait! Minecraft in a Chicago Movie Theater: this weekend! JC Penny has great Christening outfits! TryItMom.com by Kimberly Huber is licensed under a Creative Commons Attribution-NonCommercial-NoDerivs 3.0 Unported License.